Nana Addo in a shot with the NPP’s Odododiodio parliamentary candidate for 2016 Nii Lante Bannerman. 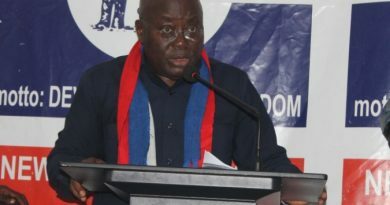 The 2016 presidential candidate of Ghana’s main opposition New Patriotic Party, Nana Addo Dankwa Akufo-Addo, has called on the rank and file of the party to help build a formidable party in the run-up to the 2016 general elections. This, in his view, is one of the surest ways the party can wrestle power from the incumbent National Democratic Congress government, whose 7 year tenure in office, according to him, has been marked by incompetence, mismanagement of the Ghanaian economy, rising levels of unemployment, widespread corruption and worsening standards of living of the Ghanaian. “Ghanaians are looking up to us to solve their problems. Therefore, we need victory in 2016 not for ourselves in the NPP, but for Ghanaians. 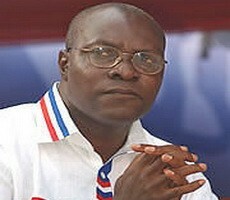 We are the people who can change Ghana, and we can only do so if we build a formidable NPP,” he said. Nana Akufo-Addo made this known when newly-elected NPP parliamentary candidates from the Odododiodio and Afram Plains South constituencies paid separate calls on him. 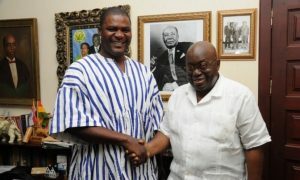 Accompanied by a large entourage of current and past party executives from the constituency, he indicated to Nana Akufo-Addo that he was already in the process of getting the rank and file of the party in the constituency firmly united behind him, and will stop at nothing to bring onboard the two other aspirants who contested him in the June 13 primary, Reginald Niibi Ayibonte and Nii Annan Tackie. Nana Akufo-Addo, who addressed the delegates from Odododiodioo thanked them for their presence at his Nima residence. 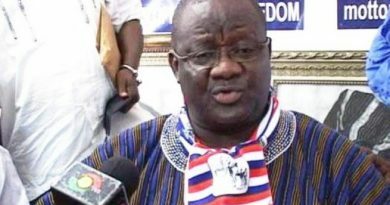 The NPP flagbearer revealed to the gathering that he had already spoken to other two aspirants and has urged them to throw their support behind Nii Lante Bannerman. This was met with rousing approval from the gathering.